Almost all mobility scooters require two rechargeable batteries. In most cases, these two batteries are contained in a sealed unit called a battery-pack. If you buy a scooter from SpinLife, our price includes the battery-pack and the appropriate charger. The pack is charged either onboard the scooter or separately, depending on the make and model you chose. To be sure you have enough battery power to get to and from your travel destinations, you should get into the habit of recharging the batteries daily – plug in at night and unplug when you want to use it the next day. Then, plug it in again at night. You should charge the batteries at least once a week, even if you don't plan to use the scooter. Each manufacturer provides a battery range indicating how far you can drive the scooter on one charge whether you are traveling on flat terrain or hills. Battery life per charge depends on terrain, the amount of weight the scooter is carrying, how fast you're going, the ambient air temperature, and proper charging among other things. 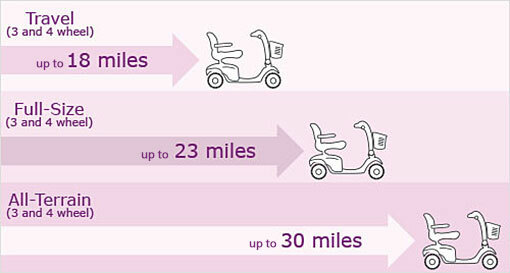 Most ranges are given based on the assumption of the scooter being driven by a 150 pound person on a flat surface with new, fully charged batteries. For example, this is critical to know if you truly need to go 15 miles per day, weigh 250 pounds, and will be driving on hilly terrain. In this case, you might want to carry a second battery pack or buy a scooter with larger batteries for a longer range. General Battery Range by Scooter Type. To make your battery last as long as possible, follow the manufacturer's instructions on how to charge it and perform maintenance checks. 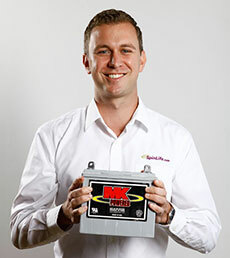 Batteries typically last 1-2 years when well maintained and properly charged. However, a scooter that is used 5-7 days per week will require battery replacement annually. Eventually all batteries will need to be replaced. When you notice your range decreasing, and when you find your charge not lasting as long as it used to, it is probably time to replace the batteries. In the winter or other times when the scooter might not be used, it is important to maintain a charge in the batteries. Batteries will drain and if not maintained may never hold a charge again. If a scooter is not being used on a daily basis, you still need to charge it. This is important because if you let your batteries drain too low, they sometimes will not be able to charge up again and they will have to be replaced. Plugging the scooter into a wall outlet and leaving it will not solve the problem. Once the batteries are fully charged, the power going to the unit to charge it cuts off, and the batteries slowly start to drain. If you unplug the unit, turn the scooter on and off, then plug it in again, the charging will resume. Standard SLA batteries for most mobility products are made out of AGM (absorbed glass mat). They are popular because they are less expensive and supply enough energy for a typical user's everyday needs. The downside is that they do not have as long of a life cycle as gel batteries. You may have to buy new batteries more often. To get the maximum life of these batteries, we recommend never fully discharging the batteries. Gel Batteries are a type of sealed lead acid battery, but instead of a glass mat, these batteries hold their battery fluid in a gel form. This means the battery fluid does not float free and is held within the silicon-like gel material. In the event of this battery cracking; you would not experience an acid leak. These batteries also offer a "deeper discharge", meaning you can allow them to lose almost all of their charge without damaging them. Gel batteries also have a lower exhaustion rate, so a single charge will last longer than a single charge on a standard SLA battery. You can go further, longer. However, these batteries can be damaged by overcharging, so be sure to monitor your battery when charging. Overall these batteries can allow for a longer life-cycle than an AGM battery when properly maintained. Overcharging can cause decrease in life expectancy.